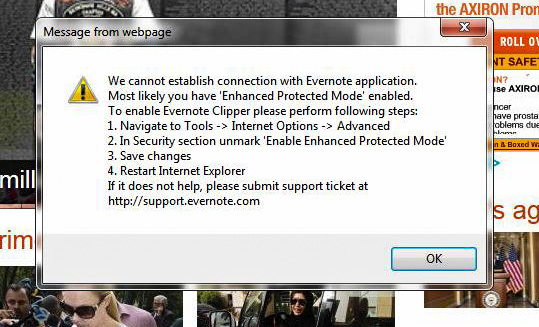 This entry was posted in Troubleshooting and tagged Evernote, Internet Explorer, Internet Explorer 10 on October 11, 2013 by Merlin Halteman. After I fixed Internet Explorer 10 crashing on start up, (previous post) I ran into another issue. Every time I would try printing a web page out of Internet Explorer 10, my browser would freeze and then crash. I started looking online for a fix. I searched on forums and all over the internet but could not find a fix for this issue. Here is some of the troubleshooting I went through before I found the fix. I tried running Internet Explorer 10 as administrator. I ran it without-addons. I ran Internet Explorer with Enable Protected Mode, selected and deselected. I tried everything I could think of. I then decided to check for Windows Updates. In Windows Updates, there was an update for a DisplayLink Display Adapter (01E6). I installed the DisplayLink Adapter Driver Update. I then tried printing a webpage out of Internet Explorer and it worked fine. Every since I installed the DisplayLink Driver Update I was able to print out of Internet Explorer 10. That seems like a weird fix for a IE 10 printing issue and I can’t explain why it worked. My theory is that since I selected, use software rendering instead of GPU rendering for accelerated graphics (look at previous post), the graphics driver would freeze or hang and then in turn I couldn’t print. So if you are having issues printing out of Internet Explorer 10, one thing I would try is to update your graphics/display driver. If this fixes your issue like it did mine, let me know by posting in the comments. This was posted by techspeeder. This entry was posted in Troubleshooting and tagged Drivers, Internet Explorer, Internet Explorer 10, Printing on September 12, 2013 by Merlin Halteman. One of our customers wanted the latest edition of Internet Explorer for Windows 7. So I downloaded Internet Explorer 10 for them. When I would opened Internet Explorer 10, it would instantly crash on start up. Here are the steps to resolve the issue. Go to Control Panel > Network and Internet > Internet Options. 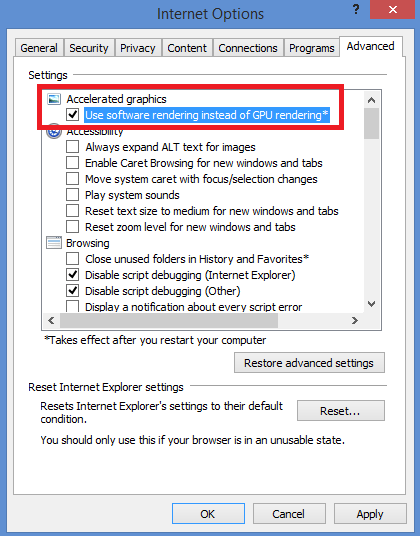 Next click on the Advanced tab and check the box Use software rendering instead of GPU rendering. Then restart your computer. Open up Internet Explorer and it should now work fine! This entry was posted in Troubleshooting and tagged Internet Explorer, Internet Explorer 10, Windows 7 on September 11, 2013 by Merlin Halteman. This version of System Recovery Options is not compatible with the version of Windows you are trying to repair.